One year after the Mt. Polley disaster, Hazeltine Creek now resembles a dry canyon. Photo by Kim Goforth. • Mining in BC could cost BC taxpayers more than a mine produces in its entire lifetime; that’s the bottom line. The Mount Polley Mine, owned by Imperial Metals, is a prime example. Most BC mines are like nuclear power plants in that mine wastes and toxic heavy metals must be managed for over a thousand years. As long as it rains and snows, heavy metals must be filtered out of the mine wastewater, even when the mine is closed. No toxic wastewater is allowed to leave the mine site and enter into the environment. This is the theoretical mandate – to prevent pollution – of the Ministry of Environment, which failed miserably in preventing the Mount Polley Mine collapse. pewing over 25 million cubic metres of toxic water and waste material down the mountainside and into the pristine waters of Quesnel Lake, a large tributary to the Fraser River. The dam burst is considered to be the worst mining disaster in Canada’s history. According to local resident Craig Ritson, the water filters provided were not suitable to catch fine toxic material. “They started off with a 50 micron filter, then many weeks later Imperial Metals came by again and gave us a finer filter of 25 microns. Months later, we find out from scientists that we needed a filter that is less than one micron. Imperial Metals shows up again with a filter that is .4 micron. Well within a day, that filter was clogged up and none of the taps worked. “We realized the government and Imperial Metals did not know what was in our drinking water and they could not protect us and we needed to take matters into our own hands. We bought an expensive, professional water treatment plant for our home,” Ritson added. Many family homes and cabins owned for generations on Quesnel Lake now sit empty or are up for sale. While property values have changed due to the spill, causing real estate values to plummet, there has been no compensation from our government for those dealing with property loss. Tourist values have also changed. Resort owners are suffering seasonal losses and, again, there has been no compensation from the BC government. Nothing has been given – not even a future promise – yet during the recent flood in the town of Cache Creek, Christy Clark was right there with her cheque book doling out thousands of dollars to flood victims. Skeed Borkowski is the fishing guide for Northern Lights Resort near Likely. “They killed my beautiful lake,” bemoaned 67-year-old Borkowski. “It’s a little late to start over; we don’t have 10 years to rebuild the business. This is the age where we cram for finals, before we circle the drain. “Since the spill, I have not had one sip from Quesnel Lake. No one really knows what’s in there… metals such as mercury, arsenic and lead that the company itself declared were in its tailings pond,” Borkowski added. The Interior Health Authority issued a bulletin not to eat the fish due to mercury. Lake trout sampled in the Quesnel Lake show elevated mercury levels in fish gonads. Air quality around the disaster area, including the town of Likely, has changed. The wind whips up over the dry tailings storage (16 sq. kilometres) and down the mountainside through Hazeltine Creek (now a canyon). The dust then falls like soot on the surrounding area, collecting in many homes and cars. No one knows what’s in the dust from Mount Polley Mine and it worries many local homeowners. The biggest change is the people around the area. They do not trust some of their neighbours and that mistrust started immediately following the disaster. Residents in Likely who spoke to the media against the mine disaster have received anonymous, threatening phone calls. “I’m surprised nobody has been killed here since the spill,” said one Likely resident. “That’s how bad things have gotten here.” Resident Ingrid Ritson, who lives along the Quesnel River, said the mine’s misfortune has torn the town apart. The Liberal government announced Mount Polley Mines had applied to reopen the mine and over 8,000 letters were sent to the Ministry of Energy and Mines about it. A ministry spokeperson stated that over 7,500 letters came from an online campaign sponsored by Western Canada Wilderness Committee in which all opposed the reopening. There were an additional 480 private letters from people stating they were opposed to the mine opening. Only about 20 letters arrived from people who thought the mine should open again. About 2% were “for” and 98% were “against” the re-opening of the Mount Polley Mine. On July 10 of this year, the BC government gave the green light for Imperial Metals to reopen its Mount Polley mine, 11 months after the mine tailings dam broke and dumped 25 million cubic meters of toxic-laden sludge into the environment. If Mount Polley Mine had been properly managed at the outset, with cradle to grave economics, the Ministry of Energy and Mines would have had the proper bonding in place, upfront. 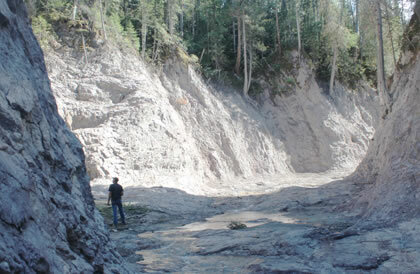 Mount Polley should have had at least $1,000,000,000 in bonds in place before the mine even started production. But the Mount Polley Mine Incorporation had only a few million in their reclamation bond when they started; they should have had a bond for mine site reclamation (50 million) upfront, water treatment facility (about 100 million), water treatment salaries and maintenance for over 1,000 years (350 million) and an insurance policy in place that would immediately pay out $600,000 dollars in clean-up insurance, in the event of an accident. The total pre-start bond should have been well over a billion dollars. Mount Polley Mine will never produce enough profitable ore to pay back the public for the damage done to the environment. Two engineering firms estimated the damage at around $600 million dollars. Mount Polley has only spent 67 million on clean-up and the rehabilitation of Hazeltine Creek. Basically, they planted seed and willow on the slurry filled banks to try to restore the creek to its natural state. What hasn’t changed is that our provincial government continues to be the lapdog of corporate mining in BC. The BC Liberals have their hands firmly in the pockets of some of the biggest polluters of western Canada and the telltale signs were there from the beginning. Following Canada’s biggest mine disaster, Energy and Mines Minister Bill Bennett acted as the unofficial PR spokesperson for Imperial Metals. He referred to the largest spill of heavy metals as “no more damaging than an avalanche.” We were assured that water containing substances known to cause brain damage, organ failure and cancer posed no danger to our health. Bennett did everything short of declaring mercury, a neuro-toxic compound, as the greatest vitamin for a higher IQ. He was oblivious to any negative effect coming out of Mount Polley. Why would he do this? Well, the Liberal Party owes part of its provincial election win over the NDP during the last election to Imperial Metals, the owner of Mount Polley Mines. And one of the company’s major owners was a significant donor to the Liberal Party. Let’s start with Imperial Metals’ largest shareholder, Murray Edwards, who holds more than a 39% stake in Imperial Metals. According to the Alberta Venture, Edwards has a combined value of two billion dollars in equity holdings. He is also the co-owner of the NHL Calgary Flames team. Edwards donated $153,480 to the BC Liberals and Imperial Metals donated over $200,000. Finally, Edwards is one of the BC Liberals’ main fundraisers. As an example, he hosted a dinner at Calgary Petroleum Club and raised over a million dollars for Christy’s campaign. Think about this; our premier goes to Alberta to fundraise for her BC party. Back to Murray Edwards. His oil heavyweight company, Canadian Natural Resources Ltd. (CNRL), churns out more than 817,000 barrels of oil equivalent per day of oil and gas. His company has been cited by the Alberta government for spilling 357 barrels of crude oil in Red Earth Creek and he has been cited for flaring twice as much sour gas as any other producer. One of his operations was halted for contaminating an aquifer after Benzene, a carcinogen, showed up in the tests. We have reached a sad state in BC politics in which our democracy has been hijacked by corporate power. In order to win elections, one needs major corporate money, but there seems to be a price for taking this money. The rule appears to be you do not bite the hand that feeds you! Despite two major ongoing investigations into the criminality of Mt. Polley, Minister of Energy and Mines Bill Bennett has permitted the restart of Mount Polley Mine; it looks like Bennett’s cozy relationship with Imperial Metals is enduring. On July 22, 2015, Mount Polley Mining Corporation applied for a new discharge permit to dump 9.5 million cubic meters per year of mining effluent into Quesnel Lake. Residents of Likely and Quesnel Lake say his application is disgusting, ridiculous and crazy and that the government is out of its frickin’ mind. This article appeared in the AUGUST 2015 print edition © Common Ground magazine.